Almost all of my software is based on Linux. Over the last few months I have been moving it onto Windows also. This has been made easier by the use of the wxWidgets library. It is possible that I may also rewrite Baken to use that library at some stage and it too will then become available for Windows. For Windows I supply a pre-built installer, just download the .exe file and run it, the rest should be self evident, for Linux I only supply source code. I am willing to answer most questions on my software but experience has shown that Mandrake Linux has a problem. Therefore I will not support someone using my software under Mandrake. If you work out how to get it to work on Mandrake simply then drop me a line and I may reconsider my stand on it. 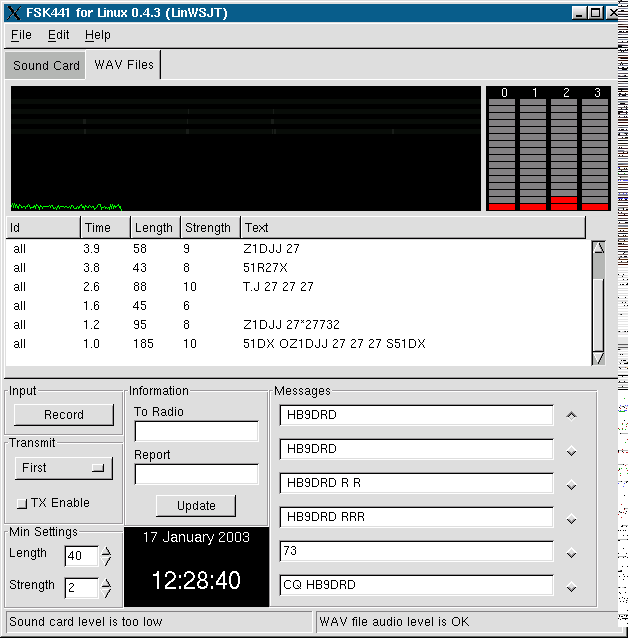 WS Tools is an implementation of FSK441 and JT44 (and one day JT6M) which runs on Linux and Windows, and maybe some day on the Mac. 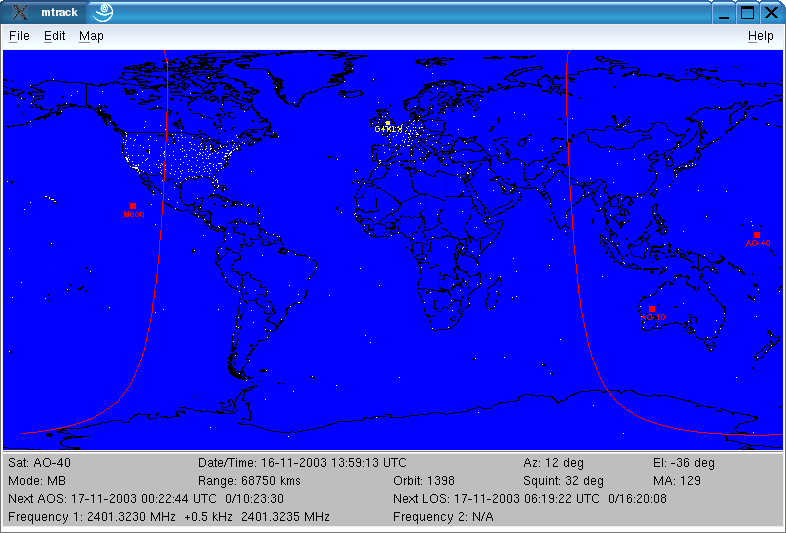 It is open source and uses different algorithms in the main from those used in the original WSJT. I am working on WS Tools to both teach myself DSP techniques and to provide open source implementations of these data modes. 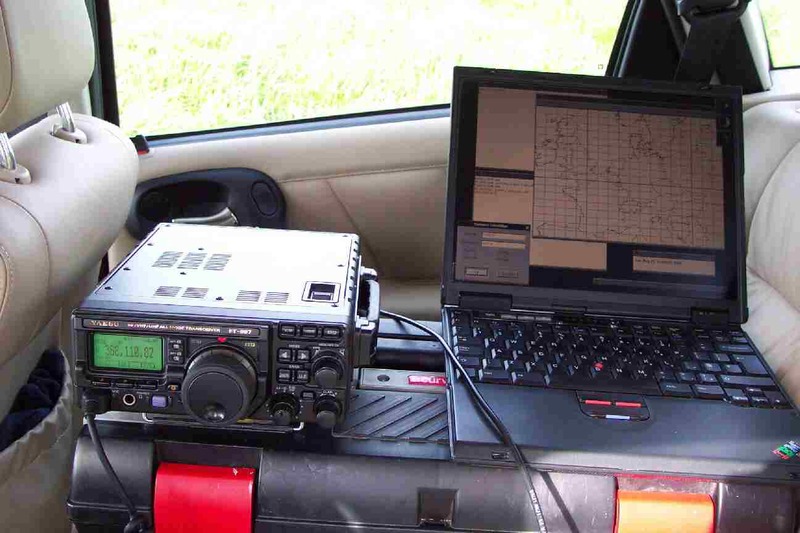 I believe that amateur radio software should be open source, its in the spirit of the hobby. FSK441 is used specifically for Meteor Scatter, usually on 2m, its advantage is its very high data rate so that even a "ping" of 40ms can still provide useful data. JT44 is an effective weak signal mode for EME (moonbounce) and Troposcatter, it can typically decode data when the signal is below the noise level for most people. JT44 has now been superseeded by JT65B which I would implement except that I would not be able to match the performance of WSJT due to the use of proprietry techniques that I have no hope of replicating. I do have plans to leapfron JT65B onto something better, but its all a matter of time. I may have a go at JT65B in due course but it would not be as good as the WSJT version. If you would like to read more about these modes then have a look at Joe Taylors K1JT website or its mirror here. I have no plans to implement FSK441B and FSK441C as they have not found favour in Europe, which is the main centre of MS activity. I went to the UKW-Tagung at Weinheim on the weekend of 7/8.09.2002 and met a number of EME operators who expressed an interest in the development of JT44 for Linux, thanks guys. While at the show I bought a sound card to radio interface from Dierking, as well as the interfacing it also allows me to use one microphone and one headphone for two radios which I find very useful. I also wrote a paper about the development of my JT44 software and was published in DUBUS 4/2002, it is available here as a Word for Windows document. An earlier version of this paper appeared in the proceedings of the Leuven Microwave Meeting in November 2002, this newer version has diagrams and better descriptions. These screen shots are little old now, but they give a flavour of what the programs look like. Newer screen shots will be provided in due course. If you want to build WS Tools from the source code under Linux, then you requires the wxWidgets, the FFTW, and libsndfile libraries to build. It is probable that your Linux distribution already has libsndfile already included. If you are a Windows user then you can simply use the WSTools.exe file which is a proper installer, you will then be able to use the software immediately. If you want to build WS Tools under Windows then you will need to install MinGW and MSYS, FFTW as well as the Windows version of wxWidgets which is named wxMSW, to build a proper Windows installer you will also need a copy of NSIS. The versions that I used were MinGW 3.1.0-1, MSYS 1.0.9, wxMSW 2.4.2 and NSIS 2.0. If you are using any part of WS Tools please send me an e-mail. I am very interested to hear of your successes and/or failures with it. 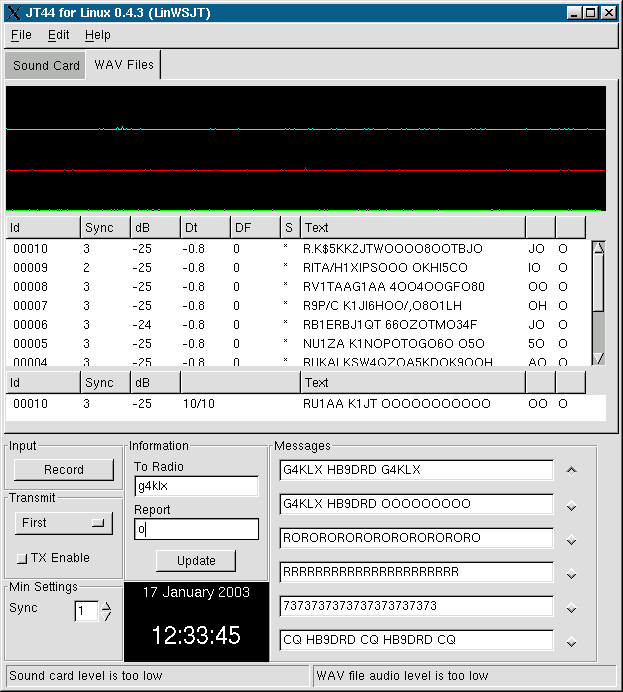 The first known QSO using JT44 from WS Tools (LinWSJT as it was called then) has been reported by Milan OK1XH. It was made on Sunday 26.01.2003 at 0941 UTC between OK1XH and OK2POI on 50.254 MHz over a path of 225 kms. Initial power was 20W which was reduced to 1W with perfect copy. I found the following DX Cluster information via Google. Morten LA2YMA (ex LC1OCT) has made many MS QSOs on 2m using FSK441, and publicising the fact on the DX Cluster. He is probably the first person to make a QSO using FSK441 (as well as finding some bugs with it), and I listened using FSK441 during the 2003 Geminids, it was very exciting. I am still waiting for the first WS Tools JT44 EME QSO to be reported. If you have made such a QSO then please send me an e-mail and I will publicise the fact here. I would really appreciate it if both Windows and Linux users try this version out and give me feedback on it. The file WSTools.exe is a Windows installer which will install WS Tools just like a professional program. If you want to build WS Tools for yourself on Windows then see my entry for UKW Tools below which details the software that you will need to do so. The purpose of this project is to provide a set of tools which allow for microwave operators and mobile radio implementors to be able to survey locations. It grew out of my need for a Linux implementation of the G4JNT GEOG suite of BASIC programs for DOS. This work well under DOSEMU under Linux but they are limited to just the UK. By its nature (it is based on UK-only NGRs) it is not easy to adapt it to cover other areas. Here are a few screen captures of an older version to show the program in operation. I apologise for the image quality, I had to compress them quite hard in order to make them reasonably small. The first picture is the main screen of UKW Tools and this is the main control centre for the rest of the program. Here you can see a pseudo-3D map of a part of Derbyshire, the county where I live. The area on the right gives information about what is happening on the map. From here the other functions can be started. You can see that there is a location in the centre of the map marked as Alport Heights. The second picture is a line of sight coverage plot from the location marked as Alport Heights. This is a major communications site and pictures of it can be seen on my pictures page. The green area represents the coverage from the top of the mast to any structure which is 8m above ground level, I have also included some local towns on the map. 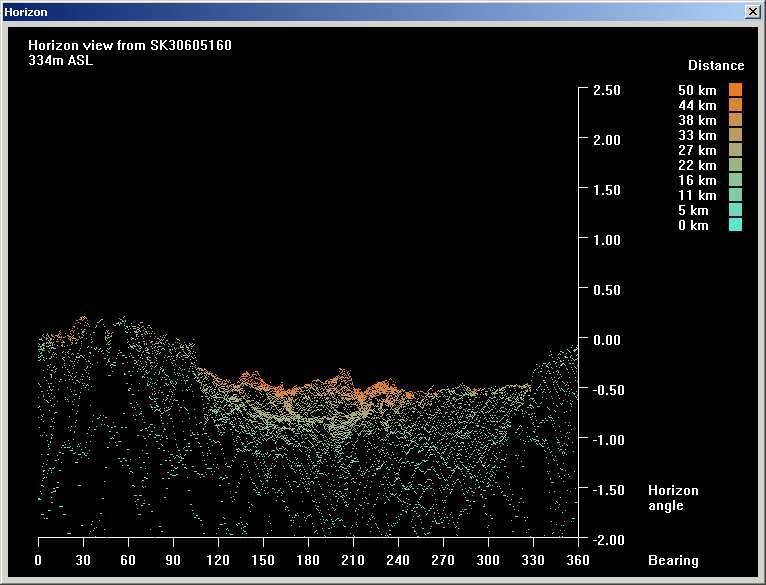 UKW Tools can plot two such sites simultaneously so that overlapping coverage can be seen. 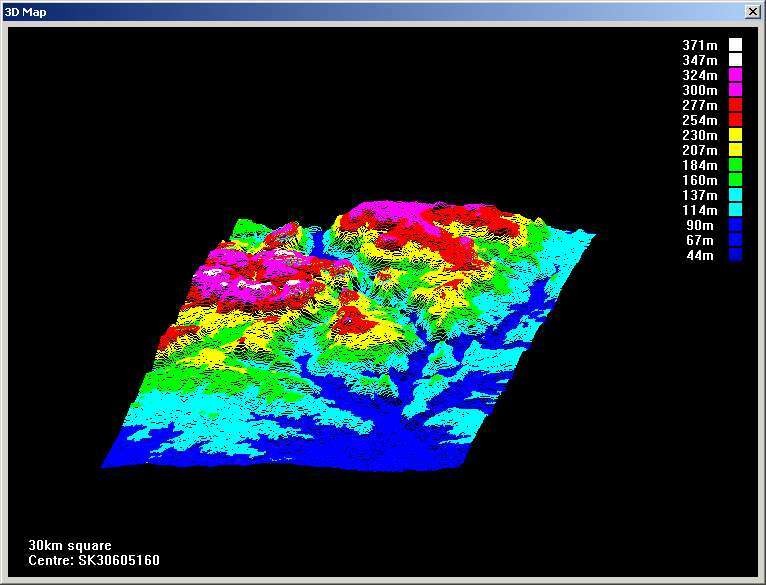 The third picture is a 3D plot of a 30km square centred on Alport Heights. The palette may be changed as can the viewing angle and other parameters. The fourth picture is the horizon view from Alport Heights (from the top of one of the masts) up to a distance of 50kms. As you can see, in most directions it has a sub zero elevation angle and it is an excellent location. That is why there are seven communications masts there including the Home Office and more mundane things like the GB3DY 70cms amateur repeater on RB10. The fifth picture is of a path plot from Alport Heights to the mast of Zycomm Electronics in Ripley. 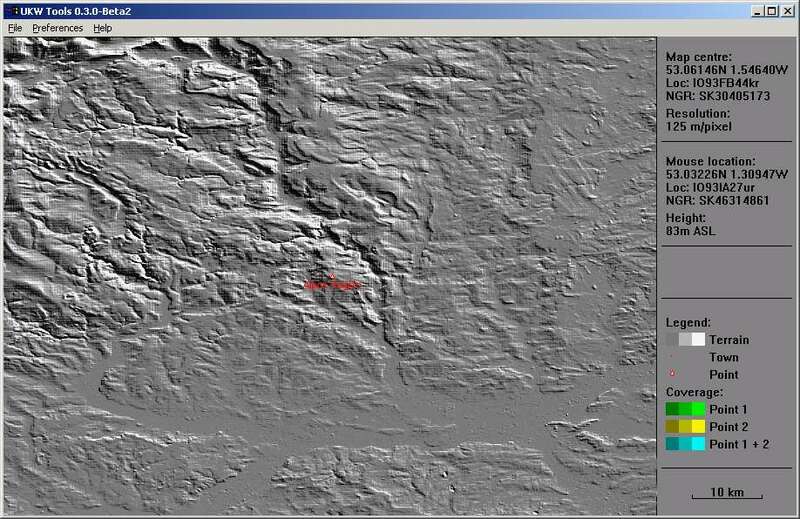 It is not a great distance but it does show the quality of the SRTM data. At some point I would like to compare this plot with the one generated by a commercial package which we have at work. 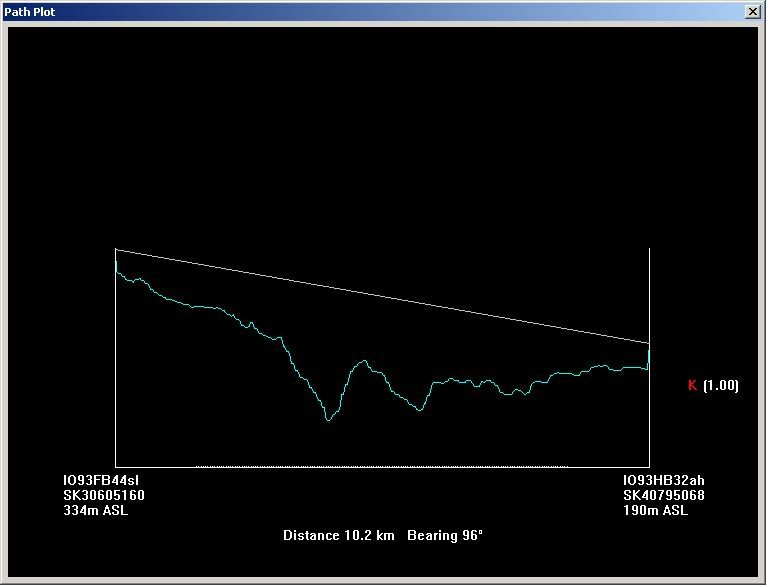 The first large valley from the left is where Ambergate is located, this is where my first house was, as you can see it was not a good location for anything above 136kHz. Like WS Tools above, UKW Tools requires the wxWidgets library. For Windows you will need a copy of MinGW and MSYS as well as the Windows version of wxWidgets which is named wxMSW, to build a proper Windows installer you will also need a copy of NSIS. The versions that I used were MinGW 3.1.0-1, MSYS 1.0.9, wxMSW 2.4.2 and NSIS 2.0. Apart from some changes in the GUI, it all works fine. In fact all of the screenshots were made under Windows 2000. On Mac OS X you can use the standard GCC and wxGTK and build it as a X11 application. It also runs fine on 64-bit Linux on an AMD Athlon, apparently it is amazingly fast on that platform. 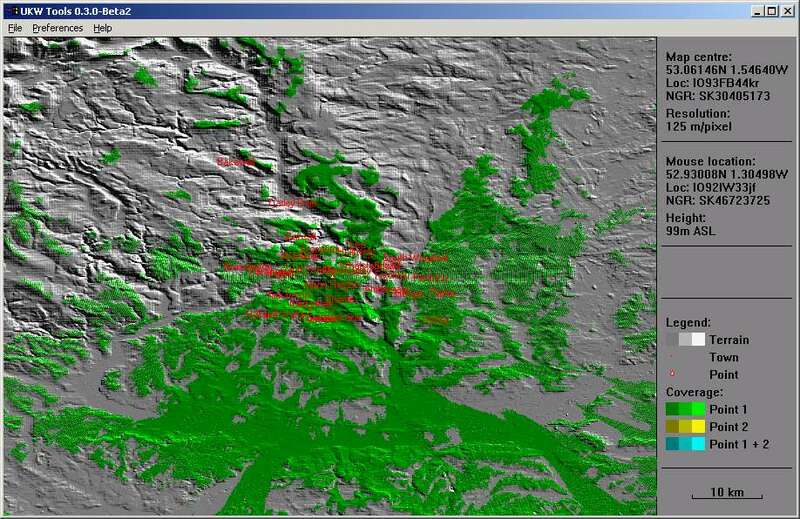 The latest versions of UKW Tools include the Irregular Terrain Model routines that allow for relatively accurate forecasting of coverage over line-of-sight and non line-of-sight paths. There is a detailed README file within the package that explains how to use it. The Windows executable file is a pre-built copy of UKW Tools with a proper Windows installer. It was built on Windows 2000 and will work on Windows 98, ME and XP. There is a crude icon for UKW Tools which is used on the Desktop and the Start Menu shortcuts, if someone wants to provide a better one, please do so. You need to download the SRTM data for your area, but you only need GTOPO30 data OR Globe data for your area, not both. 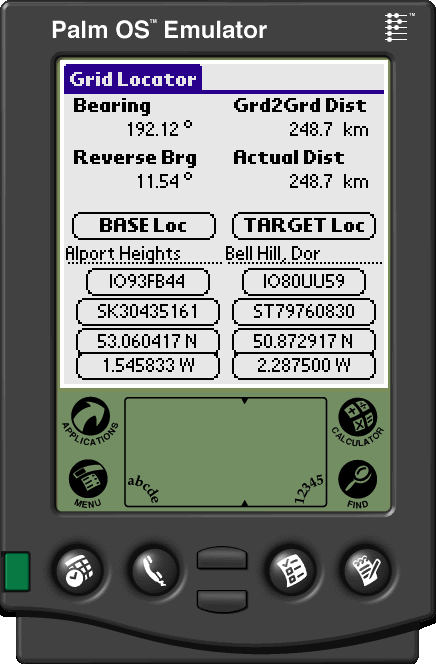 I personally use GTOPO30 and that is better tested than the Globe data in UKW Tools. Also the GTOPO30 files are smaller than the Globe files. Another things to watch out for is that under Windows, WinZip makes unreasonable assumptions when unpacking the GTOPO30 data. Before extracting the GTOPO30 data, go into WinZip Preferences and switch off "Intelligent CR/LF translation in TAR files", or words to that effect. Also note that SRTM files don't exist for areas that are entirely water but my calculator doesn't understand this so it may reference SRTM files that you won't find anywhere. I am collecting files of sites and towns for countries other than the UK, and with permission will make them available here for other people to download and use with UKW Tools. I will make my complete UK town list available as well as the sites list that is included with UKW Tools. If you can provide a town or sites list then please drop me a line, I can do simple format conversions if needed. This is a small project that I worked on because I had been given a Palm PDA (an M505) by a friend and I decided to have a play and see what I could do with it. Since I am a developer I decided to have a go at developing for it and I found a need for a program that would allow me to calculate distances and bearings while out portable on the microwave bands. I played with Paul W1GHZs BD program and independantly Peter G3PHO found the GL program which was a little better. In order to make it more useful for us here in the UK I added support for eight character locators (like IO93FB44) and for the UK only NGR system. Along the way I Anglicised the help file and headings and upgraded the database handling to allow for more database files. The resulting version of GL works well and has been used in the field (literally) with good results. I contacted the original author about my version of GL but got no reply. So I make my version of GL available here for all to use, under the same GPL licence as the original, I do not plan to make any enhancements to GL, but I will do bug fixes. If you have a great idea for GL then contact me, but remember the memory size of the Palm is small so please be realistic. If you just want to install the program on your PDA then just download the gl.prc file and upload it to your Palm. The zip file contains the source code, and the .prc file, for people who want to change the program or just look at some Palm C code. I built it using the open source Palm development tools running under Cygwin on Windows 2000, as was the Palm OS Emulator. This is a satellite tracking program that I wrote many years ago (about 1990/91) and was originally run under DOS and supported the Hercules monochrome graphic card. I ported it to use Motif under Linux in around 1994 and the modified it to use the GTK widgets in 1999. This release 0.3 is a large upgrade to 0.2.3, it includes the possibility to track multiple satellites simultaneously, corrected squint display (including AO-40 squint mode), and a display of next AOS/LOS dates and times. This screenshot was made under Linux, but it will probably build and run on most UNIX versions provided GTK has been installed correctly. MTrack can also be built to run under Windows by using the Cygwin tool set and installing the Windows version of the GTK widgets. To build it under Windows requires some editing of the makefile and is only recommended for experienced developers. Please note that I am no longer maintaining MTrack, now that Predict has reached a much greater level of usability then I recommend that all MTrack users should migrate to it. Baken is a program to allow the displaying of VHF, UHF and microwave beacons within Europe. I originally wrote it in 1999 to find all the local 3cms beacons to my old QTH in Z�rich. The biggest problem that I found with this project was finding up-to-date and accurate information about beacons, especially on the microwave bands. Many beacons on the higher bands are personal beacons and are not co-ordinated. Thankfully the DUBUS list includes personal beacons and other non-IARU beacons and that is the basis of the beacon list in the current version. 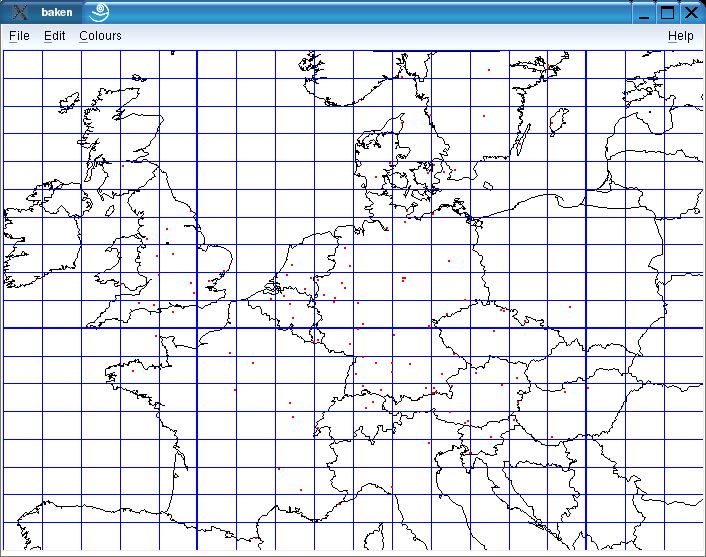 The first picture shows the main Europe map of beacons for 3cms, by clicking on a locator square (JN47 in this example) another window with details of the beacons in that square are displayed. By moving the mouse near to a beacon in the window, detailed data about that beacon is displayed as well as the distance and bearing from the home location. From version 0.4 the program can now display multiple bands simultaneously as well as many other locations, the distribution includes packet nodes and voice repeaters from around Europe. Please note that these screenshots are from Baken 0.3 and there are some small differences compared to the latest version. Baken 0.5.1 and later include the option to calculate a reflection point given two locators and two bearings, this is very useful for Rain Scatter. This picture is of Baken being used by Paul M0EYT (as G4RFR/P) in the May 2003 6/3cms cumulatives contest. Its always nice to see my software being used and have it reported to me. It inspires me to work on it and to add new features, so if you use my software and you like it, then drop me a line and tell me, I really appreciate it. Like MTrack, this program was built under Linux using the GTK library and like MTrack it should build and run on most UNIX platforms with little or no modification. It will also build under Windows using the Cygwin tools and the Win32 port of the GTK/GDK/GLib libraries. Please note that there may be some portability issues within the code for any platform other than Intel at this moment, it is hoped to remove this issue in a future version. My eventual aim is to roll the functionality of Baken into UKW Tools to provide a primitive GIS system for microwave amateurs. This is a long term project and may take years, especially since both Baken and UKW Tools work well as they are.